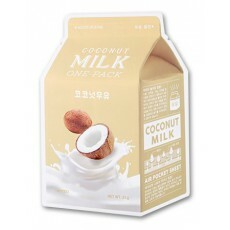 The Milk One Pack Sheetmask Coconut from A'pieu is made of 100% cotton so soft and absorbent. It is enriched with dietary fiber, coconut extract and Vitamin B to provide long lasting hydration to your skin. After cleansing and toning, open pouch and apply sheetmask on the skin. Leave for 15-20 minutes. Remove and pat in remaining essences to your face, or to other parts of your body like neck, arms or legs.